Just loved this place ,you would almost believe you were in Europe. 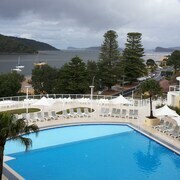 Situated in Ettalong Beach, this motel is within 1 mi (2 km) of Anderson's Marina and Ettalong Diggers Club. Putty Beach is 2.7 mi (4.3 km) away. Contemplating a break in Ettalong Beach? Whether you're the type to pull together a meticulous itinerary or totally wing it, there's a hotel here with your name on it. Take a look at our 10 accommodation options within 5 kilometres of the action downtown. Time to stop dreaming and start adventuring! Not really a morning person? Never fear! 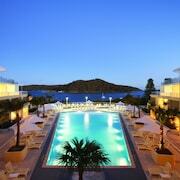 City hotels such as the Bells At Killcare and Mantra Ettalong Beach allow you a few sleep ins. You'll find 3 available hotels in Umina Beach, which is just 2 kilometres from the heart of town. 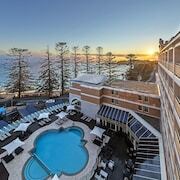 If you want to stay here, try the NRMA Ocean Beach Holiday Resort and Ocean Beach Hotel. Another handy locality, 4 kilometres away from the centre, is Woy Woy. It boasts 2 options available, including the Watersedge Motel and The Bayview Hotel. 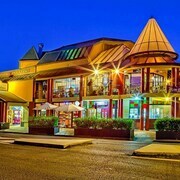 Shopping addicts will appreciate heading to Killcare Village Shops, one of the notable stores here. You'll be chuffed to learn that the Ettalong Beach Tourist Resort and Ettalong Beach Apartments are pretty close by. Because let's face it, who wants to drag their feet back to the hotel after a long day's sightseeing? Looking for more options? The Kims Beachside Retreat can be found 25 kilometres from central Ettalong Beach, and the Bellagio by the Sea is 25 kilometres away. The Pullman Magenta Shores Resort, 30 kilometres away, and the Avoca Palms Resort Apartments, 10 kilometres away, are some other options. 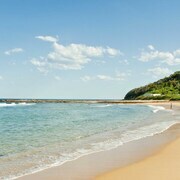 Don't shoot through before you've checked out the Toonwoon Bay Beach and Swadling Reserve in Matcham. 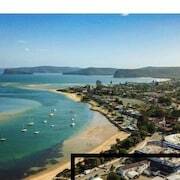 The Apollo Resort Wamberal and Tiarri Terrigal are a few of the great accommodation options here. 15 kilometres to the north of Ettalong Beach you can also stay at Lisarow, which is home to the Gosford Inn Motel and The Willows. Crackneck Lookout and The Skillion are just some of the most popular points of interest to check out when you're in Lisarow. After being cramped in a cabin seat all night, a nice comfy bed at the Rydges Sydney Airport Hotel will feel heavenly! If it's chockers there, check out the Mercure Sydney International Airport. Both are super close to Kingsford Smith International Airport, which is 50 kilometres from the centre of town.